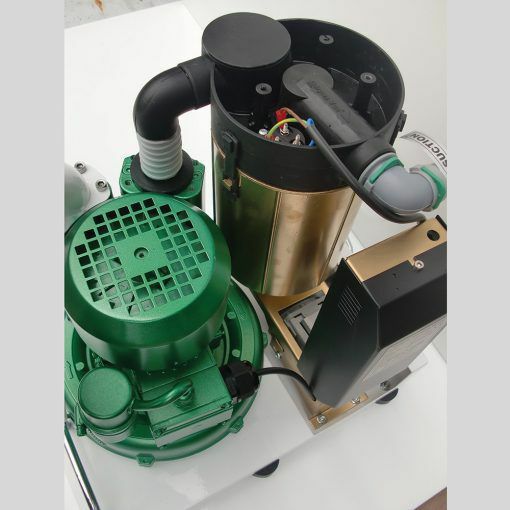 The Corpus Vacuum Motor is a dental and medical device for dental clinics and dental treatments to create negative pressure with which fluids can be aspirated from the patient’s oral cavity to keep the operating field clean and dry. Corpus Vacuum Motor is designed by high quality in accordance with the latest ergonomic and technical concept. It can work more than 8-10 hour continously. The suction motor housing is produced by high quality and made of die cast lightaluminium alloy as all high technology. Also the impeller is die-cast light aluminum and it consists of a large number of short radial blades. That ís why it has high torque during sucking of secretion.